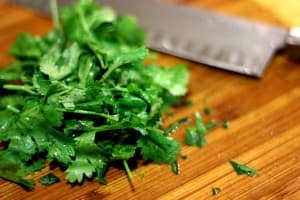 I am fortunate that my greatest lapses in miscommunication with my partner result in inconveniences such as excessive cilantro in the house. When one has too much cilantro, the easiest answer comes in the form of Hari, or cilantro chutney. 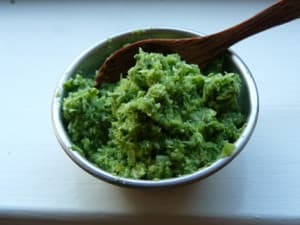 If you’ve ever dipped your samosa or papadum in the little dish of green sauce served at an Indian restaurant you’ve had this bright and delicious condiment. Even though it’s a favorite of mine, I’ve never made it until now. Inspired by a cilantro chutney I picked up in Vancouver at a Food Truck show (Pella’s Gourmet may not even be available outside of the Vancouver Farmer’s Market these days, but they are a delicious find worth supporting to international fame) I tried my hand at cilantro chutney. The result is spicier, chunkier and less tart than the sauce I attempted to mimic, but it holds it’s own as a legit condiment. I have served it alongside both salmon and lamb this week. It pairs well with fattier proteins as the astringent nature of cilantro cuts the heaviness of the meats, but it will also do well with chicken or other lighter protein sources. An all around condiment, it adds a touch of liveliness to meats, soups, and eggs. Place solids in vitamin or food processor and blend until finely chopped. Add liquids, thinning with water to desired consistency.